Scooper - Technology News: Can smart partnerships transform health in Africa? Can smart partnerships transform health in Africa? Africa’s vision of socio-economic transformation and the consequent prosperity of its people are dependent on the continent’s ability to find immediate and lasting solutions to its healthcare challenges. Underpinning this transformation is the need for innovations that will create more resilient, effective and sustainable health systems and deliver value to patients faster and more cost-effectively. Is Africa there yet? No. But many innovative partnerships offer a different way of approaching the challenge of health-system transformation to more effectively advance the health of Africa’s people, and deliver on Africa’s aspirations. A virtuous cycle exists between health and economic development. Better population health is an important driver of economic progress, as healthy populations live longer, are more productive and can save more. Economic growth, in turn, provides an enabling basis for investments in health. There is no better time than now to chart out Africa’s health system transformation. The continent’s economies continue to grow faster than almost any other region in the world. Furthermore, emerging innovations offer a historical opportunity to boost progress even faster. Breakthroughs in vaccine research and development – against malaria and Ebola, for example – enable healthy people to stay healthy, and save money that can be invested elsewhere. The pharmaceutical industry has been transforming its product development, market access and pricing strategies to better meet the unique and diverse contexts of African countries and their patients’ needs. Advances in sectors such as mobile technology allow faster, more efficient and more patient-centric care without the sunk costs of massive landline infrastructure. Such innovations can synchronize critical information in patient history, diagnostic imaging and prescription regimens, for example, to allow for more effective decision-making and access to otherwise inaccessible communities. 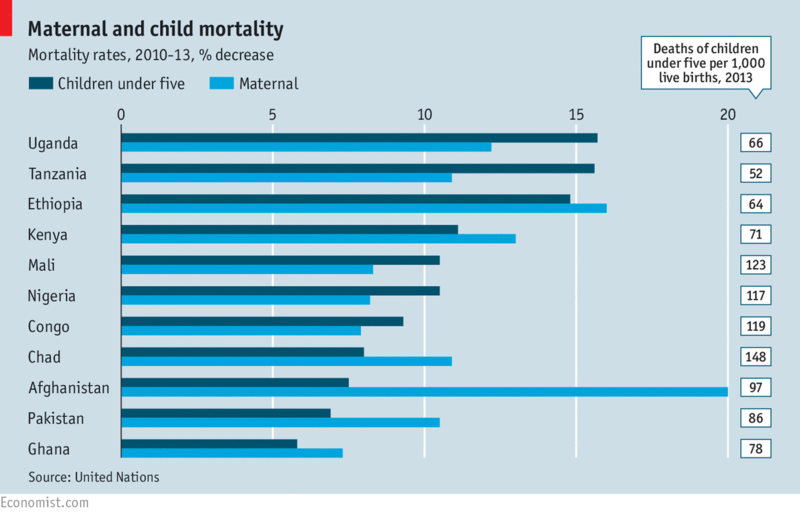 Great strides have been made, for example, in reducing maternal and under-five mortality around the world, by 44% and 58% respectively between 1990 and 2015; yet much more still needs to be done. How to leverage innovation and new partnership models to achieve these ambitious goals is at the heart of the discussions at the World Economic Forum on Africa in Kigali, Rwanda, in May. The push for transformation in Africa’s health systems must be propelled by broad and concerted mobilization of all sectors of society towards this common goal. This requires a new approach to partnerships, one able to effectively engage the entire health ecosystem. This ecosystem approach brings together a wide variety of stakeholders (governments, private sector, NGOs, multilateral agencies and the UN, international-development donors, private foundations, etc) to align in finding innovative solutions to complex healthcare challenges. This builds on past experience from developed economies and puts in place strategic enablers that allow countries to “leapfrog” health development stages that were previously unavoidable. Partners can then align on desired outcomes, work together to apply mutually reinforcing innovations, skills and resources from all sectors to effectively redesign, finance and scale up the healthcare solutions. This approach is in contrast to more traditional public-private partnerships (PPPs) where partners delegate a particular project or activity to a public or private organization. The heart of the EWEC partnership is a collective effort to move beyond individual action by companies in order to have an impact on low-resource settings with populations in dire need of better, more accessible healthcare. It combines strong political leadership, financing through multilateral agencies such as the World Bank’s Global Financing Facility and technical expertise through UN agencies and NGOs. It also leverages the private sector’s capabilities, skills and resources. Adolescents make up 24% of Kenya’s population and this demographic bulge has huge implications for the country’s health and development, and future. Currently, 18% of adolescent girls in Kenya give birth or become pregnant before they turn 20. Kenya is among the 10 most heavily challenged countries for pregnant women; between 6,000 and 8,000 women die every year during childbirth, many of them adolescents. A new project, being announced at the World Economic Forum on Africa, involves Merck Sharp & Dohme (MSD), through its MSD for Mothers initiative, investing $1.5 million towards a combined effort by JHPEIGO and the Kenya Red Cross to explore and document innovative approaches to adolescent and youth sexual and reproductive healthcare (AYSRH) in Mandera and Migori, two of the six counties targeted in the partnership. The project will also inform the national rollout of Kenya’s AYSRH policy. The project aims to increase the capacity of Mandera and Migori county governments to sustainably provide sexual and reproductive health services for adolescents and young people through public and private sector healthcare providers. It also aims to increase access to and demand for contraceptive services among young people in the two counties; and increase community acceptance and support for young people accessing sexual and reproductive health information and services. The Forum’s leapfrogging initiative has been a key enabler of the partnership’s effort, helping to identify the best-suited innovations, mobilize the required resources from public and private stakeholders, and effectively set up such partnerships. The aim is for the partnership to be a best-in-class example of how to design and implement comprehensive leapfrogging programmes in health, and be replicated in all 47 of Kenya’s counties, and maybe even the entire African continent. MSD’s investment comes eight months after the launch of the partnership. The experience demonstrates how catalytic an ecosystem approach of partnerships can be in mobilizing collective action and investment for health-system transformation for a noble cause with defined purpose. Women, children and adolescents, after all, are the future of Kenya, the African continent and the world. The time is now for moving from commitment to action.